March 18-24 was National Poison Prevention Week. While our blog post may be tardy, it's never too late to raise awareness about the risks associated with using pesticides and how to protect yourself and your family from accidental poisoning. Halloween is upon us, and what better time to resurrect some chilling stories from this year that highlight consumers misusing pesticides with disastrous results! These cautionary tales are merely a sample of the preventable deaths, unnecessary sicknesses, hospitalizations, and serious injuries reported to the California Department of Pesticide Regulation (DPR) this year. Keep pesticides in a locked cabinet. 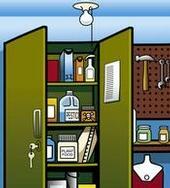 March 20-26 is National Poison Prevention Week. Every third week in March, the Poison Prevention Week Council holds this event to highlight the dangers of poisonings and how to prevent them and ensure the safety of children and adults. Products should be kept tightly capped in a locked cabinet, out of the reach of children and pets. Always keep pesticides in their original container.